We’re totally opening ourselves up to being called the Fun Police (amongst other things) with this post, but quite frankly we don’t care. We would rather you guys know all the facts so that you can make an informed decision because really, isn’t that what life is all about?! We also want to make it very clear that we are totally in favour of fundraising events, especially for cancer, given our Mum is currently undergoing Chemo treatments for Leukemia. So this post is not about stopping fun or stopping fundraising, it is purely about educating you on what goes into this colourful concoction. Colour Runs have grown in increasing popularity in recent years, with a lot of schools running their own fundraising versions. 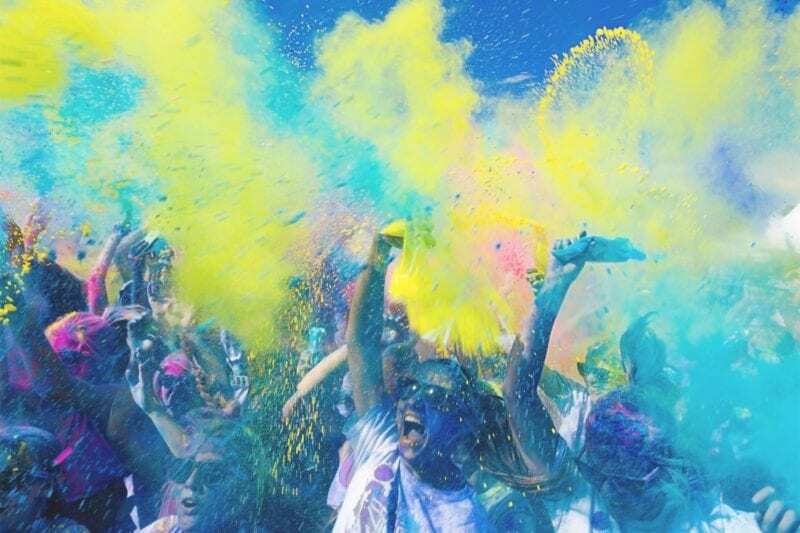 For those of you who don’t know what they are, they’re a fundraising event that sees you run 5km through a never-ending shower of coloured powder. This powder is thrown on you at various stations along the run and the participant comes out the other end covered in colours. It actually sounds like a load of fun and kids love it… (this is the bit where we are going to be called the ‘fun police’) but there are some real issues that we need to consider here. The thing that concerns us the most is the long term effects that this colourful powder is having on our kids! We’re not going to sit here and dictate what you guys do because guess what, Jo has done the Colour Run and so have her kids. Yep, check out the photos. It sure looks like a lot of fun and honestly, I know that at the time the thought did enter Jo’s mind that she didn’t want to be the fun police and not let her kids participate even though she was hesitant given what could be ‘possibility’ in it. But as you guys know, and as stated above, we are all about giving you the information so that you can make an informed decision. We have contacted The Colour Run for clarification, to see exactly what their ‘natural’ colours are made from, as this sounds a little contradictory to us. But to date have had no reply. It would be our guess that the colours are synthetically derived and made from by-products of coal tar. These colours are incredibly cheap, in fact, they are a whole lot cheaper than 100% natural colours derived from beets or carrots etc. We would love to be proved wrong, but we are not holding our breath (pun intended). The reality is that unless you are living additive-free then the amount of food dye each person is exposed to on a daily basis is quite a lot. And given that artificial food dyes have been linked to cancer, skin irritations, breathing difficulties, behavioural issues and more it is something that we certainly have the right to question the organisation about. For more information about the damaging effects of artificial food dyes, check out our recent blog post where we wrote to Maybelline regarding artificial colours they use in their scented eyeshadow palettes. You can read it >>> here. We know that there are lots of kids that react badly to food dyes with Jo’s kids being some of them. Think about it, when you open a box of cornflour at home it poofs everywhere, so imagine just how much is airborne at one of these events. The powder is literally everywhere and very hard to avoid. It was suggested by another mother to simply “tie a bandana over the child’s nose and mouth”… umm, no thanks. All that is going to do is make it harder for that child to breathe and you will still get the powder into your lungs anyway. Not really the best suggestion, sorry. Clearly, this powder becomes incredibly problematic for people who suffer from respiratory issues such as asthma. And even if you don’t have issues like that, we can’t see how breathing in this much corn starch could be good for anyone (just our opinion)! The thing that broke our heart from the post in the chat group was a suggestion that those children who cannot attend these events should “stay home” that day. Yes, that really was suggested and even what some parents felt was their only choice. But let us step back even further, what prompted Tracey to write the post in the chat group in the first place was after a concerned mother questioned this event and if people knew more information, unfortunately, she was not given very helpful answers, to the point where she deleted her original question from our group. This is something we will never tolerate in any of our forums, so hence, Tracey wrote her two bobs worth. So, back to what do these kids do if they can’t attend? In a world where it is becoming more and more exclusive, why perpetuate that even further at a charity event. Isn’t a charity event supposed to bring the community together to raise much-needed funds for a worthy cause? Shouldn’t we be teaching our kids to include everyone, to find other ways to raise money, other ways to have just as much fun. Isn’t that the message here! We are happy to say that the response to Tracey’s post in our Facebook Chat Group was way more tipped in favour of inclusion rather than exclusion. With most people agreeing that they would rather see schools holding fundraisers that allowed the whole school community to attend, in all capacities, and without risk to health or safety. So, again, we don’t think it is a question of not supporting events like this (given our own mother is undergoing cancer treatments). It is also not about being the fun police, because again, these types of events are lots of fun, but we also have to look at the bigger picture and do what is right for everyone. The less exposure to toxic ingredients each person has then the fewer risks for deadly illnesses in the long term. So, please, go out there, have fun, raise money and do all that, just do it in the healthiest, least damaging way possible. I completely agree with this post. As a teacher and a mother of 2 children who have eczema, asthma and issues with food dyes. I also have a problem with these events and their effect on the environment and animals ingesting these artificial dyes. My school is talking about doing a Colour Run this year and I suggested as an alternative some natural colour in water sprayers or water pistols. BYO water pistols so we are not adding to the unnecessary plastic waste. Or just a plain old fun run – you can have a theme to make it interesting, dress up etc. you could even dress up in crazy colours for a Colour Run! My daughter’s school is doing a colour run this week. As someone whom is gluten intolerant this also worries me. The school has a booklet that comes with enrolment whereby each person gets a prize for the amount of money they raise….wait, the child is not raising the money just because it’s a good cause. No it’s so they receive some plastic crap at an inflated price. How does this work? Seems the people behind the colour run must be making a a tidy profit. Go back to cake stalls and run a thons and skip a thons.